“I’m looking for some bush type cucumbers and green beans. My community garden is small and last year my cucumbers took over. This year I want to start with multiple color potatoes and Bush green beans. The 4×8 raised bed can produce a lot more food than you imagine. Because the cost of shipping and handling can be more costly than the seed you ordered, I’m sticking mainly with one seed company. First, here are my suggestions for the crops you said you want to grow. 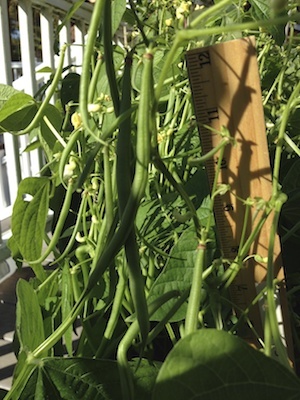 Bush green beans – Seeds you can find locally at big box store or garden center. Plant a few seed every 2 or 3 weeks for a continuous supply of fresh green beans. Don’t plant them all at once unless you are planning to can or freeze green beans. 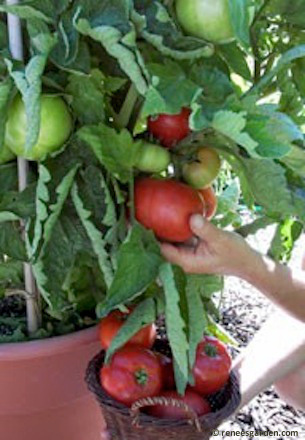 Celebrity – Compact plants produce heavy yields of medium sized tomatoes on disease-resistant plants. 75 Days. AAS Winner. 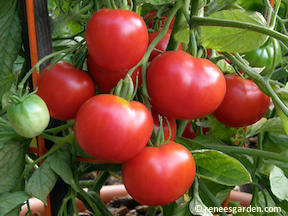 Jet Star – An indeterminate, 4′ – 5′ tall plants produce big yields of low acid, bright red 8 – 9 ounce fruits. 72 days. Heirloom. 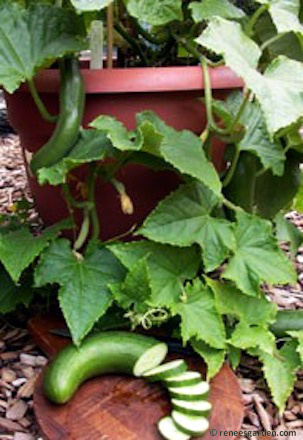 Cucumber – Consider adding a trellis for long straight cucumbers that take up little ground space. 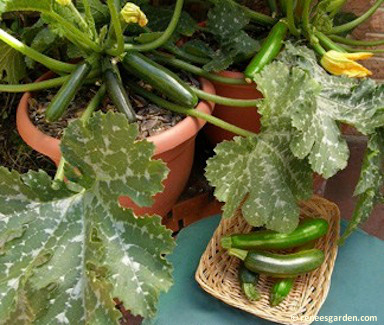 Or grow bush cucumbers. More suggestions for a small space gardens. You will have room for more vegetables by choosing the plants ment for small space or container gardens. Squash – bush type varieties of summer squash are easier to see, watching for size. Container grown zucchini is easy to pick. Check every other day to keep squash size in control. photo: Renee’s Garden. Turnips – Plant in both spring and fall. Before you plant these seed, there is plenty of time to plant lettuce, spinach radishes, green onions in the space where tomatoes and peppers will be planted after the ground is warmed enough, 50° F.
Also, you can plant peas, bush snow peas or spring peas. Add Herbs. 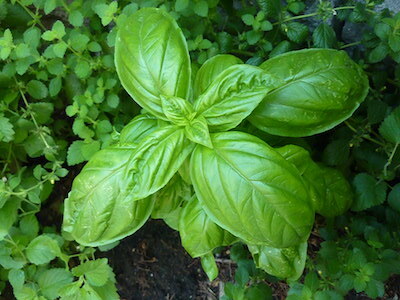 Buy a few starter herb plants to tuck into empty spaces. 2 or 3 parsley, 1 basil, 1 dill. When your tomatoes are in full production, use the tomatoes and parsley to make Tabouli. Add dill to vinegar and marinate cucumbers. Sprinkle torn basil leaves over tomato slices or stir into tomato sauce. I am starting container grown tomatoes from seed. Super Bush – Continuous producer of 5 ounce fruits on 3 foot tall plants. Good choice for containers and small gardens. Hybrid, disease resistant. ← This is the photo that convinced me to grow Super Bush. Use concrete blocks to build a raised bed. Quick, easy, lasts forever. Grow a theme garden. This one is a spaghetti sauce garden. A 4′ x 4′ raised bed is big enough to grow enough produce to make fresh spaghetti sauce and freeze or can a few jars for winter. Build a spaghetti sauce theme garden in a 4′ x 4′ concrete block raised bed.